BeachBody Performance Energize Review: Pre Workout for Ants? Wow I actually like the taste of this pre workout way more than I thought I would. Especially for a lemon flavor! What I find amazing is that Beachbody didn’t even really go out of their way to make the name sound jazzed up or anything. With all the effort that they go into marketing they couldn’t even say that the flavor is ‘cool lemon ice’ or something like that? Geez guys. But maybe what is going on here is that they don’t really focus as much of their efforts on the supplement side of things in terms of product development because maybe they are so caught up in selling their workouts. In that sense it might be alot like the Perfect Fit Protein from the Tone It Up girls. They have amazing workouts but if you read my Perfect Fit Protein Review that I just did the other day, you can see the product is really sort of half-baked. But that is NOT the case so far with Team Beachbody’s pre workout. The name is too plain, but the flavor itself really knocked my socks off. The lemon is super tart, and has a ‘kick-you-in-the-jaw’ punch to it that I always have loved in a pre workout. It’s also just a little bit tart, and also has a third dimension that I will call a ‘roundness’. What I mean by ‘roundness’ is that the sweetness is delivered throughout your entire mouth so that if feels like the taste sensations are happening very consistently during each sip. It’s really a delightful feeling. The sweetness profile is akin to the Cellucor products where you almost taste a sort of ‘bubble-tape’ sugar sensation. It’s super hard to describe just how good this pre workout tastes with words- you just need to grab some for yourself and try it. OR DO YOU? Taste is one thing- but performance is another. You can have the best-looking car in the world. The best-looking phone in the world. The best-looking boyfriend in the world. But if he doesn’t PERFORM when you need him to- then you might as well look elsewhere. Did I just compare my ex to the Team Beachbody pre workout? Yes. Yes I did. Because here is a trait that they both share: a severe lack of performance. Don’t get me wrong. This pre workout tastes amazing. And my ex was super flashy on the outside too. But just like (cough Jason cough), they just don’t give you what you need, when you need it. I took a scoop and a half of Team Beachbody Performance Energize before a super basic workout consisting of goblet squats, lateral raises, planks, and back bridges. It was actually an awesome circuit send me an email if you want the whole routine. But you know what would have made the workout better? A pre workout that actually worked. I can’t believe that over a serving and a half (let’s be serious I took two full scoops) did not kick in for me at all! I get that alot of BeachBody customers are women but we aren’t ANTS for cripes sake. It’s like that line in Zoolander- ‘what is this… A pre workout for ANTS? !’ LOL. Great movie. But that’s what I felt like screaming out after taking a big serving of it. If you give the supplemnet facts panel a good long, hard look - it’s quite easy to see why this product dramatically underperforms. There are only four ingredients in the entire product! This is easily the lamest formula that I’ve every seen and now thinking back on my workout- it’s no surprise at all that this pre workout did not work wonders for me whatsoever. Wow that’s actually one word with no hyphens. Um. Yeah this pre workout formula is super un-inspired. I think I could have come up with this one in third grade. Except you know what? Even I would have had the presence of mind as a ten year old to put some good old-fashioned caffeine in here! Like, come on people. This Beachbody Energize review is taking a decidedly negative turn lol. I guess if i had to be nice - the four ingredients in here aren’t necessarily bad when it comes to increasing workout performance. Carnosyn beta-alanine is a really sound ingredient that I’ve always found to improve my cardio performance and endurance. However they severely under-dose you at 800mg per serving of Beachbody Performance Energize. Quercetin is also a decent add-in as it boosts immune system function and also provides a source of energy. It’s much more subtle than caffeine, but it is effective none-the-less. I personally don’t notice much of a difference with it, but you might. The green tea is also a nice inclusion, as it has been proven to assist almost every single bodily function known to man. What I don’t like about green tea in a pre workout is that sometimes it can give a little bit of an upset stomach- which I certainly did experience. I think the biggest side effect of Beachbody Performance Energize is just that: a little bit of upset stomach if you take it fasted. Ok let’s talk about appearance. Why am I failing Energize in this review in terms of packaging? Because it looks terrible. That’s why. Let’s start with the background first. It’s a black random bubble pattern that has a dark and mysterious appearance. It also makes no sense in context to the product. It looks like oil drops or something. 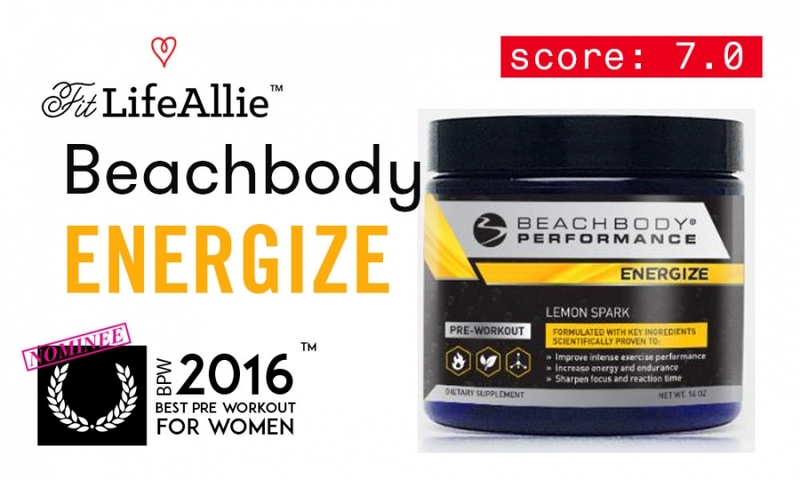 The worst part of this label design is easily the yellow faux-ribbon graphics that surround the Beachbody Performance logo and serve as the underlying strip to the product name ‘Energize’. Speaking of the product name it is much too small and doesn’t grab your attention the way that it needs to. Speaking of attention - there is absolutely nothing about this label that is remarkable or attention-grabbing in any way. It is so horribly generic that I can almost see the guy who made it. He’s not very impressive. Let’s put it that way. Ok I’m just rambling at this point. Let’s go sit in traffic!